London (Reuters): The Western Scientists have developed a brain-computer interface that examine the brain's blood oxygen levels and enables communication by decode the thoughts of patients who are totally paralyzed and unable to talk. 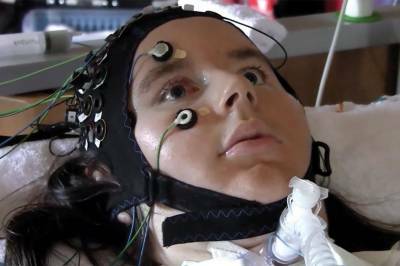 In an examination of the system in four patients with complete locked-in syndrome - incapable of moving even their eyes to communicate - it helped them use their thought waves to respond yes or no to spoken questions. People who are paralyzed except for up and down eye movements and blinking are classified as having locked-in syndrome. If all eye movements are lost, the condition is referred to as complete locked-in syndrome. The researchers heading this trial said the brain-computer interface (BCI), which is non-invasive, could transform the lives of such patients, allowing them to express feelings and opinion to their loved ones and carers. The researchers said, counter to expectations, the patients reported being "happy" despite their condition. A neuroscientist at Switzerland's Wyss Center for Bio and Neuroengineering, who co-led the study Niels Birbaumer said, "The striking results overturn my own theory that people with complete locked-in syndrome are not capable of communication". The examination trial, published in the journal PLOS Biology on Tuesday, involved four patients with Amyotrophic Lateral Sclerosis (ALS) - a progressive motor neuron disease that destroys the part of the nervous system responsible for movement. The researchers asked different questions like a personal questions with known answers, such as: "Your husband's name is Joachim? ", and open questions that needed yes or no answers, such as "Are you happy?". The near-infrared spectroscopy and electroencephalography (EEG) technologies are used in the BCI method to measure blood oxygenation and electrical activity in the brain. Birbaumer told Reuters "The machine records the blood flow... and calculates how (it) changes during "yes" and during "no", and the computer develops an idea, a pattern". "And after a while, we know what the patient is thinking, when he thinks "yes", or when he thinks "no", and from that we calculate the answer." The "known" questions elicited correct responses seven times out of 10, and the question "Are you happy?" resulted in a consistent yes response from the four people, repeated over weeks of questioning. Director of the Wyss Center John Donoghue welcomed the work as "a crucial first step in the challenge to regain movement" for completely locked-in patients. He informed that his team now plans to build on these results to develop the technology further and eventually aim for it to be available to people with paralysis resulting from ALS, stroke, or spinal cord injury.